Unless you're planning to breed your kitty in the future, there are lots of practical reasons for neutering a cat. There can be significant benefits to your kitty's temperament and behavior when you spay or neuter, especially when you do it at the proper time. There are currently millions of unwanted cats living in shelters and on the streets. With so many animals homeless, it only makes sense to limit some of the breeding taking place. Plenty of loving cat owners never intend to breed their pets, but never have them spayed or neutered. Then, when a female comes in heat and manages to escape through the door, she becomes a target for every stray Tom in the neighborhood. Female strays also wander through the neighborhood singing their siren songs until normally complacent male house cats can no longer resist and begin spraying in the house, and trying to find a way to get outside. This situation benefits no one, but spaying and neutering cats does. Neutered male cats tend to make calmer pets. Neutering eliminates the chance of developing testicular cancer later in life. Males rarely have a desire to spray/mark after neutering. The strong odor of male cat urine is greatly reduced. No breeding means no sexually transmitted infections. Neutered cats lose the desire to roam. All things considered, neutered cats have an increased chance to live longer, healthier lives. Neutering cats is done under anesthesia. This causes some cats to feel nauseous, and if they throw up while not fully conscious they may aspirate, or choke to death. As a precaution, cats should fast for approximately twelve hours before the procedure is carried out. This means no food, no water and no special snacks. The stomach needs a chance to empty its contents so there will be nothing to throw up. Conveniently, most veterinarians schedule surgical procedures early in the morning, so the easiest plan is to empty your cat's bowls the night before and let him sleep through his fasting time. 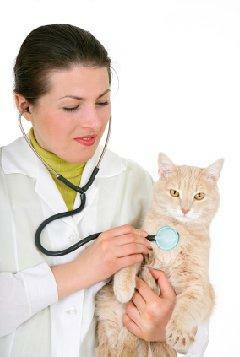 Neutering cats is actually a very simple, minimally invasive procedure compared to spaying females. Once anesthesia has been administered, the vet disinfects the cat's scrotum and makes a small incision. The testicles are then drawn out, the tubes stitched closed and the testicles snipped free. The incision in the scrotum is extremely small, and is usually left unstitched to allow drainage during healing. Healing is usually quite quick, and most males will feel normal after the first day. It takes approximately ten to twelve days for the incision to heal, so the cat should be kept dry during this time. There seems to be two separate camps when it comes to deciding the appropriate age to neuter a cat. Traditionally, it was thought better to hold off on neutering cats until they were mature and fully developed, usually around six months old. These days, many vets recommend neutering cats as young as eight weeks old. By this age the tissues are not so delicate, and the procedure can safely be performed. It should be noted that neutering a male well before six months of age can significantly affect your cat's adult appearance. He'll never develop the look of a mature male, instead remaining kitten-like in facial features. He'll also never have a chance to develop unwanted behaviors like spraying, so there is yet another advantage to neutering young. Now would be a good time to address the old issue of neutering and weight gain. Although it's a popular theory that a neutered cat will grow fat, this is not a firm rule. If you don't want your cat to get fat, then feed him a balanced cat food in the appropriate amount, and make sure he gets some exercise. This is easily accomplished by providing your pet with a cat tree stocked with a few hanging toys for him to amuse himself. As you can see, neutering is good for male cats for many reasons, and the procedure is simple and safe. It's a sound idea to neuter any cat that will not be used in a professional breeding program, and perhaps a very good idea for breeders to neuter all male kittens before sending them to pet homes. If everyone would follow through, we could easily cut the number of homeless felines by half, and that would be a very good thing indeed.